This is my first Mono Hair Pieces and I love it! The hair is silky and shiny. I don't think it's too shiny, it's easy to style blends so well with my hair. I'll definitely order another one. This is my second Mono Hair Pieces and I love it. This is my first topper. I am frequently bending over people at my job in the Emergency room, and was worried patients and visitors would notice. I get compliments regularly from coworkers and patients at how beautiful my hair is. This is the best hairpiece I ever bought. Has plenty of hair and easy to put on and style. I had bangs cut in and nobody know it's a hairpiece. I feel like a beautiful women again. 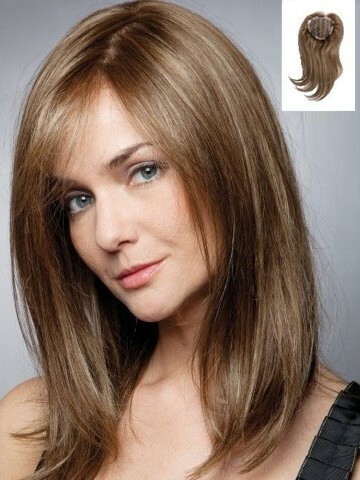 I purchased this piece instead of a synthetic hair piece because it got great reviews. I am simply stunned at how real this piece looks on my head as well as the ease of use. I feel like my old self again with this piece on and am so grateful to rewigs.com for making it so easily accessible! Thank you thank you thank you!! This piece is easy feels great and blends for the least "wiggy" look not to mention it's far more comfortable than a full wig.Thanks to rewigs.com as well shipping was fast and the order was correct as always. Initially I bought the smaller version of this which worked well for a while. But with the advancing thinning of my hair I felt I needed more coverage. The monofilament part is so realistic that it looks like my scalp even up close. I haven't told anyone I am wearing a piece and so far people have been telling me my hair looks great and thicker.